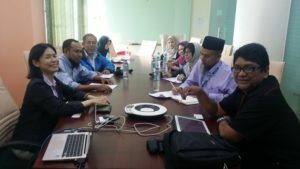 Congratulation to one of our student, Mohd Sabri Bin Mustapa for receiving Best Paper Award at Mechanical Engineering & Science Postgraduate International Conference 2016. 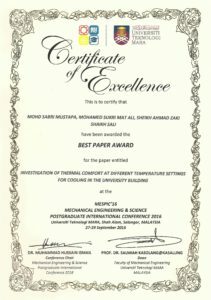 This award is given at Mechanical Engineering & Science Postgraduate International Conference 2016 for the paper entitled Investigation of Thermal Comfort at Different Temperature Settings for Cooling in the University Building. OMEDETOU GOZAIMASU!